The good news is traveling far and fast! The American Bible Society published their 2018 State of the Bible report that displays America’s latest opinions on the Word of God. Faith-filled believers weighed in on how much the Bible impacts their lives. The report was based on 1,004 phone interviews and 1,036 online surveys of adults 18 and older located within the United States. “We are finding the more engaged with the Bible someone is, the more hopeful and peaceful they are,” says American Bible Society president and CEO Roy Peterson. The 2018 research reveals, in order of highest engagement to lowest engagement, 9 percent of Americans are Bible Centered, 17 percent are Bible Engaged, 15 percent are Bible Friendly, 5 percent are Bible Neutral, and 54 percent are Bible Disengaged. 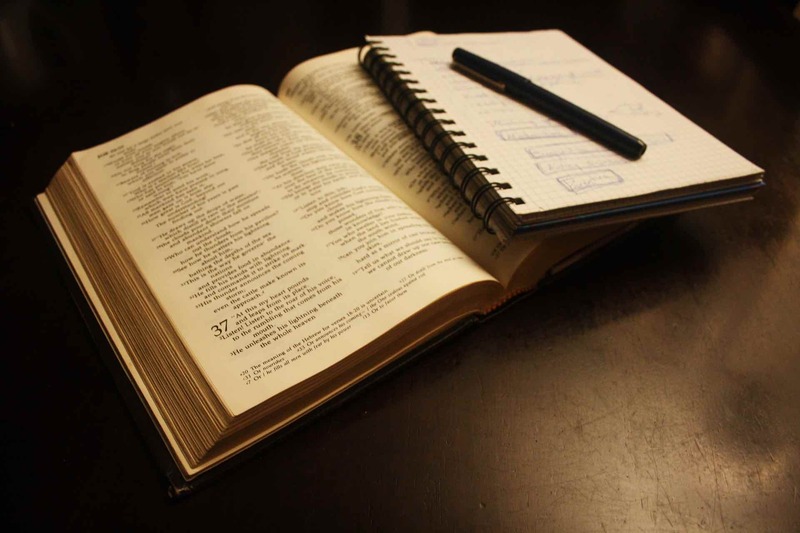 The report delves into just how necessary Americans view the Bible in daily life. Out of four possible choices – coffee, something sweet, social media and the Bible – adults were asked to choose which they consider a daily necessity. More than one-third (37%) chose coffee as fundamental to their day. Another 28% say something sweet is essential, while one in six adults (16%) say the Bible is a must. A similar number said social media (19%). 61% of Bible-centered adults insist on the Bible as a daily necessity above all else. 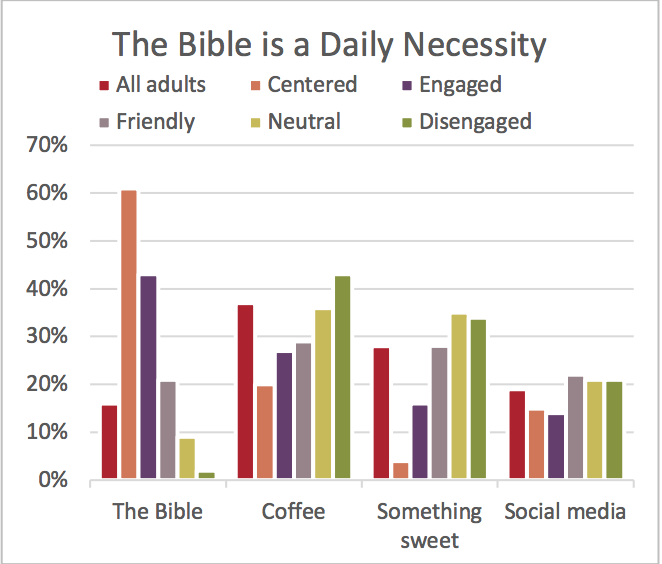 43% of Bible Engaged adults prefer the Bible over coffee, something sweet and social media. Impressively, the State of the Bible says that one-half of Americans are ‘Bible users’ – that is, they engage with the Bible on their own by using, listening to, watching, praying or using Bible text or content in any format (not including use at a church service) at least three to four times a year (48%). Bible use has remained relatively consistent since 2011. Sadly, nearly one-third of adults say they never use, listen to or pray with the Bible (32%). While Americans do report more prevalence of fear, they also experience a radical hope through the gospel. 42% of Americans say they were more fearful today than they were five years ago, but 81% of Americans are hopeful about the future. When asked a series of questions about the Bible’s intent, most Bible users see it as a letter from God expressing his love and salvation for them, a way to know what God expects from them, and a rulebook or guide on how to live their best life. More than one-third of Bible users express very strong agreement (34%-36%) with each of these statements, while one in four asserts strong agreement (24%-26%), and another one in four claim moderate agreement (23%-25%). Approximately one in six Bible users have some doubts about the Bible’s intent (15%-16% somewhat agree, somewhat disagree or disagree). The State of the Bible report has a lot to say about the positivity that the Bible has in peoples lives. According to the report, people experience a positive change in their attitude and outlook after reading the Bible. After reading the Bible, Americans are 42% more generous, 54% more loving toward one another and 56% more willing to engage with their faith. The Holy Bible is essential in the life of every believer, and followers of Christ hunger for the word of God above all else. Not only that, after reading the Bible, Christians report being more fruitful throughout their day. Regardless of any numbers or statistics, the state of the Bible will always be good.